The 833SE is another step in the evolution of the O2 – 845SE. The SE Amp Board is being used to drive an 833A through a PowerDrive board. The amp is still in the single channel prototype stage. 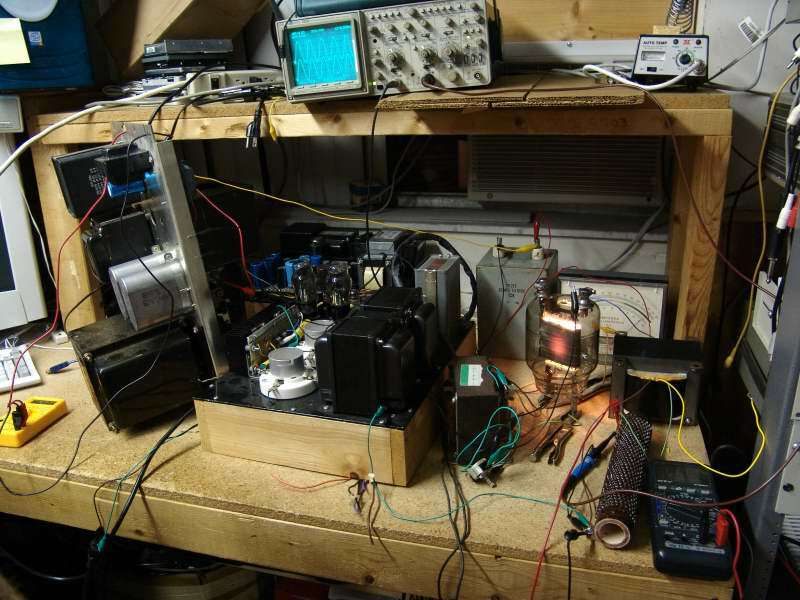 The 845SE amplifier is temporarily being used as a breadboard for 833A experiments. I got several 833A tubes in a lot of tubes that I acquired several years ago. I had been looking for an SE amp that had the punch of the 300Beast, and always wanted to build the "big one" using these tubes. Building the big one requires a big output transformer. I had a custom transformer made, This "breadboard" amp was assembled for the purpose of evaluating the sample transformer. Please don't try this at home. There is 1500 volts in that yellow clip lead! Trust me, I was nowhere near this thing when it was on. When I fired this thing up, I had a 1/4 inch lexan sheet in front of it. I had to remove it for the photo, because of glare. Here you will see an 833A tube connected up with vice grips and hose clamps. The chassis on the left is the power supply from an old Motorola public safety transmitter. It puts out 1500 volts at 500 mA. The box in the center is the 845SE amplifier. I am using it (except for the output tubes and transformers) for this experiment. The PowerDrive board will be required to drive the 833A tube into heavy grid current (A2 operation). The 845SE power supply is behind the 845SE amp. It is being used for all amp voltages except for the 833A's filament and high voltage. The 5AR4,s that generate the high voltage for the 845's have been removed, and are on the bench to the left of the scope. Due to the higher Mu of the 833A, far less drive voltage is required than the 845. In order to get good power, and low distortion out of an 833A however, grid current will be required. In this case lots of grid current (hundreds of milliamps) will be required on the positive half cycle, and none on the negative half cycle. This will be the true test of the PowerDrive board, since I never intended to hook it up to an 833A when I designed it. A mere mortal driver circuit would severely distort under these circumstances. The amp was putting out 212 Watts RMS at the time this photo was taken. It ran at this level for over 10 minutes while I measured it (using the computer) and photographed it. The meter on the right (in front) reads the output voltage. Output power is computed from this reading. I used to measure power directly with my HP8903A audio analyzer, but unfortunately it just died. The yellow meter on the left reads the voltage across one of the bleeder resistors in the power supply (there are 2 in series). The reading is doubled to determine the actual power supply voltage. The analog current meter behind the 833A tube reads the plate current. The scope shows the amplifier input and the output at the same time. In this manner I can test the amp without getting near it. Bias current was set by adjusting a bench power supply that was on the bench to the left, not visible in the photo. This should become our biggest amp design someday. While testing this amp, I ran a frequency response sweep from the board input to the grid of the 833A. While delivering over 100 volts peak to peak, the frequency response of the driver circuit was from 11 Hz to 345 KHz within 3 db. Driver response was within 1 db from 21 Hz to 240 KHz, no phase shift was observed over this range. All of this was measured while driving an 833A to full power. This is probably the biggest tube any of us would dare to work with. Find me a transformer that could do this using a 45 tube for a driver! PowerDrive works, people! I haven't had any time to test this amp any further, and I won't have any time soon either. Below are excerpts from email correspondence between myself, three of my associates, and the transformer designer. The amp is the same design (schematic) as the original 845SE. The only change is the output tube, and output transformer, and filament transformer. Later the high voltage power supply was substituted with the large one in the photo. I wanted to test the new transformer with an 833A tube. Since I didn't have a socket for this tube, I used vice grips and hose clamps. There are 1200 volts on the hose clamps. I wired all of this into the existing 845SE amp. First test gave no power, no current in the 833A at all. I could adjust the bias from -50 volts to -200 volts, no plate current. After scratching my head for a while, and changing the tube, I looked up the plate curves for an 833A. With 1200 volts on the plate and -50 on the grid I should have NO plate current, DOH. In a moment of anger I shorted the bias supply directly to GROUND. I got 130 mA of plate current. With 130 mA of current the undistorted power output is only 50 Watts. I need more current, something like 250 mA. This will require modification to PowerDrive to allow positive bias. I will try this over the weekend. The 10 amp filament puts out a serious AC magnetic field that gets into everything. Hum is evident in the speakers and on the analyzer BEFORE you turn on the power supply. As soon as you plug in the filament transformer the hum appears. Moving the transformers or the tube around has no effect. The hum balance pot has no effect on this hum. DC filaments WILL be required. The low frequency response is outrageous. Roll off starts around 25 Hz and 3 db is 11 Hz. This thing makes BASS come out of my small speakers. No evidence of transformer saturation was seen at 20 Hz, 40 Watts. This will probably change with increased current. Power at 10 % distortion is 112 Watts. 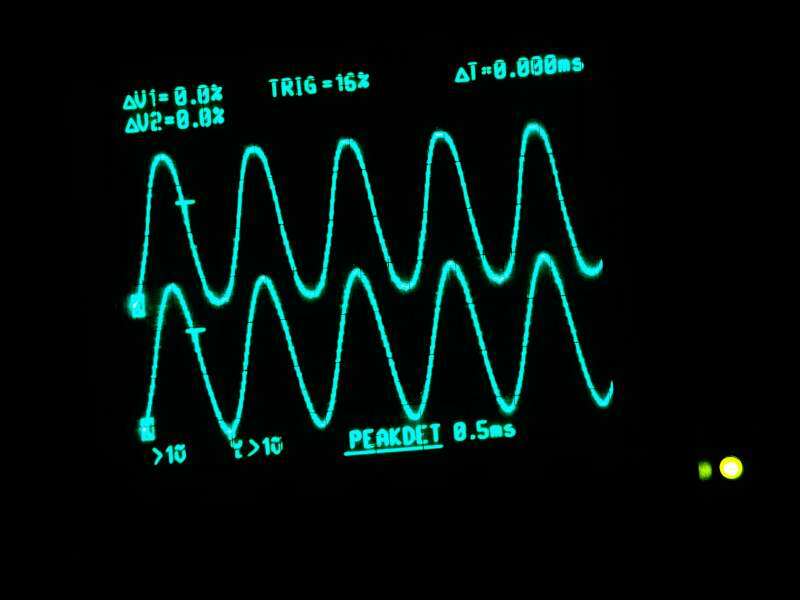 Clipping is evident on the bottom of the sine wave due to the need for more bias current. The 500 Watt load resistor got really hot after 5 minutes of this. The infrared photo (the B/W one) of the 833A shows that it didn't really like this either. Nothing else got hot. My HP8903A audio analyzer died five minutes into the test session. Gave an error 21 message, then quit completely. I connected a variable power supply across the previously shorted resistor on the PowerDrive board. This allows up to 30 volts of POSITIVE grid bias. It also allows adjusting the bias from a safe distance away from all of the serious electricity. As expected more power output was available with increased bias. I did not make any measurements at this time. It became apparent that the power supply in the 845SE was not really happy about the increased bias current. The 5AR4's began to glow at about 250 mA, and the output voltage was dropping off. I needed a bigger power supply for this amp, especially to feed two hungry channels. The tubes wanted more voltage also. I had some power supplies in my warehouse that were removed from UHF base station transmitters. I got two of the base station power supplies from the warehouse, and fired them up. Both work. The transformers in them will likely not be useful for an audio amp due to the buzzing sound that they make. Both make a buzzing sound that would be quite annoying. The sound gets quieter with increasing load, but is quite loud even with a 300Ma load. This is not uncommon for these type of resonant power transformers (Sola). The power supplies draw about 9 amps at light load (getting quite hot) and really do not like operating without a load, the output voltage runs away and the breaker blows. This tube really likes the increased voltage. This power supply puts out 1520 volts with bias at 100Ma, and 1500 volts at 300Ma. The amp will put out 205 watts RMS at 5% distortion (1KHz) when the bias is turned up to 300Ma. This is too much dissipation for the tube but I tried it any way. The higher the bias current, the higher the power. I stopped at 300Ma. Attempts to measure the low frequency response were met with blown breakers. These power supplies were made to power a 450MHz transmitter. It relies on a 15 Henry choke in parallel with a cap for filtering. There is only a 2 uF oil cap across the output. This resonant filter is useless when trying to draw a large low frequency audio current. At 55 Hz I could get about 100 Watts RMS cleanly before the bench lights began blinking at a 5 Hz rate followed by tripped breakers. Operation at any frequency below 50 Hz was met by rude sounds from the power transformer and blown breakers. I have a large oil cap from a defibrillator but I did not try it yet. I hooked up my speakers and listened for a few minutes. This thing sounds great. Bass has the punch of my 300Beast (a push pull 300B amp), transients also sound like the 300Beast, yet the whole thing does sound like a big SE amp. A really big SE amp. Even though there is enough power to blow down the house, the sound of the 45 tube used in the driver still comes through. It was about 8PM on the 4th of July. There were lots of large explosions going on outside which makes playing with high voltage quite unnerving, so I decided to pull the plug and go outside and join in. I put a 16uF oil cap across the output of the big power supply. This improved the power supplies misbehavior when the amp was driven hard at low frequencies. I decided to turn everything up full blast and see what happened. I set the grid voltage to +20 volts. Plate current was 275 Ma and plate voltage was 1490 volts. This is a plate input (and static dissipation) of 409 watts. The tube glowed a bright orange. I applied 1KHz audio and increased the drive until clipping can just be detected on the top of the trace. Plate current was still 275 Ma, plate voltage was still 1490 volts. Tube current remains constant at all output powers up to 212 Watts when driven at 1KHz. Power output at this point was 212 Watts RMS, distortion measured 4.8 %. Now the tube is dissipating 197 watts since 212 watts are delivered to the load. The plate still shows an orange spot. Some spec sheets say this is normal. The amazing fact is that this calculates to a 51% plate efficiency. A class A2 amplifier has a theoretical maximum of 50%. This indicates that the output transformer is presenting the optimum load to the tube for these operating conditions. The amp was operated at this full power point for over 10 minutes while I took several pictures and made measurements. No adverse effects were noted. Attempts to test at other frequencies were not as successful. Max power (5% distortion) at 100Hz was 160 Watts (plenty) and the tube current remained relatively constant up until 150 Watts. At 30 Hz max power was 60 Watts. Tube current rose sharply above 50 Watts. the 3db point (at 275 Ma) was 30 Hz. Operation at 20 Hz was met by excessive tube current, a bright red glow, and a blown circuit breaker. Operation at 10 KHz was similar to 1KHz. Max power was over 200 Watts (meter won't read the voltage, I went by the scope). Tube current was still 275 Ma. Operation at 20 KHz was met by extreme tube current (over 400 Ma). Distortion was evident at power levels above 50 Watts. The amp will only put out 12 watts at 26 Khz but will deliver almost 50 Watts at 30 KHz. These conditions will never be seen in a listening situation, but I am still puzzled by the unusual high frequency behavior since I have never seen this. I decided to try connecting the 8 ohm load to the 4 ohm tap to see what effect this had on power and frequency response. This presents the tube with approximately a 10 K ohm load. As expected max power was only 120 Watts RMS at 1 KHz. This power could be obtained with any tube current over 180 Ma. Plate supply voltage at 180 Ma was 1520 volts. This works out to 43% efficiency. Clearly not the optimum load for these operating conditions. With this load the tube wants more voltage, I would guess about 2000 volts. Low frequency behavior was slightly better with less complaining from the power supply and tube when pushed hard. Max power at 30 Hz was 55 Watts, tube current was still reasonable at 50 Watts. 20 Hz did not blow the breaker and slight transformer saturation was visible on the scope at 35 Watts. High frequency operation was also much more civilized with no extreme tube current. Distortion at 50 Watts was 0.93 % when operated at 1KHz. It rises to 3.4% at 50 Watts when operated at 30Hz. Distortion is under 1% at 10KHz. Sound was outrageous. Who says that A2 operation is no good for hi fi. It is all about the driver. Wimpy cathode followers need not apply. This is the beginning of the "Big One" that I have been wanting for a while. It is still based on the same SE amp PC board that all of my SE amps are based on. I will have to design a really big power supply for this one. I probably won't get back to this for a while, since I have too many things to do already. A scope plot of input VS output. Input is the bottom trace. Top trace is output. I cranked up the power until the distortion reached 5%. Hard clipping has not occurred yet. If you look carefully you will notice that the peaks of the waves have fattened up a bit. Power output is 221 Watts RMS. Frequency response test. Lexan safety shield in place! I had some time this weekend to work on the 833A amp. I found the problem with the sound card testing - bad ground on one of the cables. I now have a frequency response plot that matches the manual measurements. The response still rolls off on the high end. -3 db point is 17.5KHz. I know I have no hearing at 17 KHz, but this could be a problem with other users. I have done some digging around on the internet and found that transformers for the 833A are very hard to make due to the tubes high plate resistance. 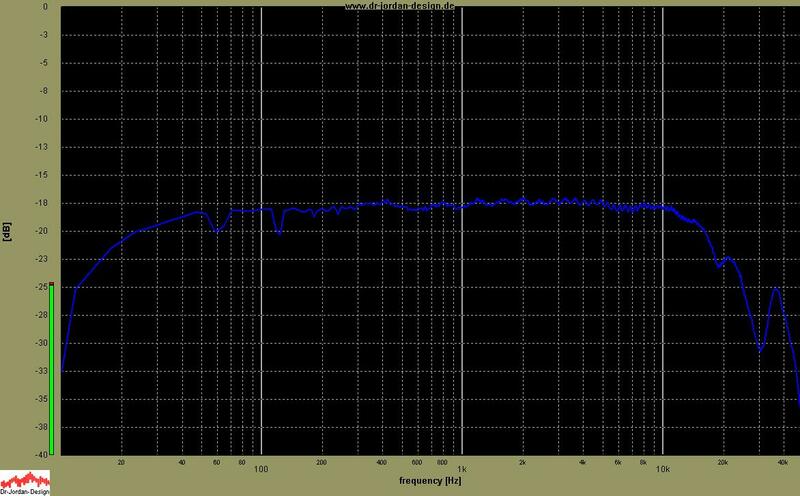 The anomalies at 60 and 120Hz are due to the AC filament on the 833A, hum is audible in the speaker. I will test the transformer with an 845 tube next (or 2 845 tubes). After that the test setup will be torn down and the transformer will be tested by one of my associates in his 833A amp. The test setup is shown above, but the safety shield causes a glare. The response is below. The scale is hard to read on the photo, it is 3 db per division. In another moment of temporary insanity (my wife questions the temporary part), I got the itch to play the guitar through this thing. I have an old ADA tube guitar preamp that saves settings, it is already loaded with presets from mellow to extreme. I connected it to the 833A test amp, which was connected to a small cabinet I built years ago containing two 10 inch Electro Voice speakers. After convincing Sherri that it would be good for her to leave the house, I punched up my best Hendrix preset, turned it up to 10 and cut loose. It was LOUD, VERY LOUD, standing in front of a Marshall stack kind of loud. I spent two hours going through every preset in the box, with and without the Zoom effects box. I used a Strat and a Les Paul. I am now convinced that this is the best sounding guitar amp that I have ever built, and I have been building them since the 60's. Clean presets are very clean, you can play very loud but clean, the distorted presets sound good at low volumes, and positively rip at full power. I blew the bench circuit breaker twice. Watching the meter on the tube current was impossible, it flew all over the place. Tube bias had little effect on the overdriven sounds but the clean, loud settings liked a lot of current. Like the guy in the movie said "I gotta git me one of these". Stratocaster, volume set on KILL, you could hear it a block away. Les Paul, good bluesy sound, also good clean sound for chords, able to get LOUD but clean. While all of this insanity was going on, I had the scope and the FFT analyzer connected, and the camera taking continuous pictures. You can see the FFT spectrum in some of the pictures. 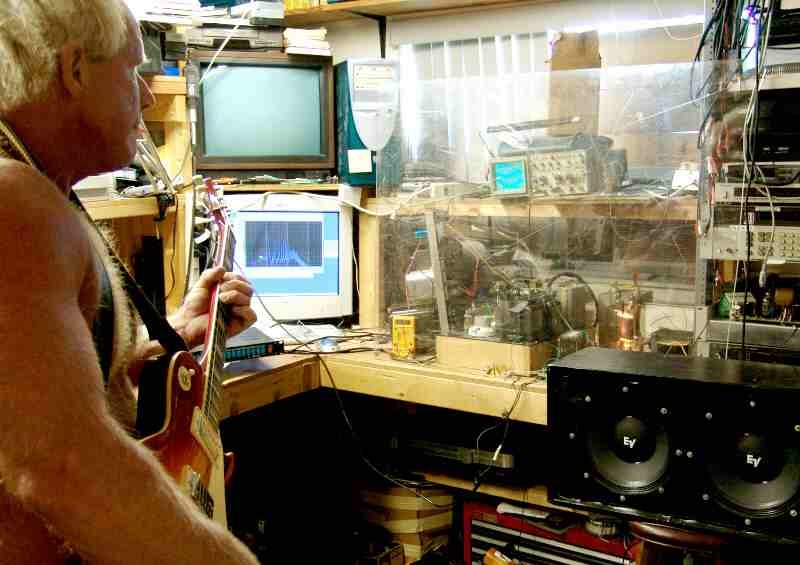 There was a thick Lexan shield in front of the amp to prevent accidents, this tended to blur the scope traces. The ADA midi guitar preamp is on the bench to the left of the computer. The 833A glowed throughout two hours of this nonsense, the output transformer was slightly warm, but it was due to the close proximity of the nuclear glow from the 833A. The power supply objected a few times and blew the circuit breaker twice. After a while I learned to mute when the room lights started blinking. The power transformer got HOT all 72 pounds of it. Ferro-resonant transformers do get hot. Nothing else got hot and nothing blew up. Lets try to blow something up! Uncontrolled feedback, the current meter was pegged for a few seconds, then the breaker blew. After resetting there was no blown parts, everything still worked. The ADA MP-1 tube midi preamp is visible behind my back, to the left of the computer keyboard. I got this on Ebay several years ago. Very useful but somewhat microphonic. It uses 2 Sovtek 12AX7 tubes. I have never tried the MIDI functions. I have a Crown CE2000 amplifier with one very dead (burnt) channel. It was the victim of an "expert". I have been using it (the good channel) with the ADA as a guitar amp. The 833A amp makes a much better sounding guitar amp. Gee it sounds more like a tube amp than the Crown does. I wonder why? It is not quite as loud as the Crown, and doesn't play cleanly, at extreme volume levels like the Crown does. For that tube amp sound, especially when in one of the distorted modes (on the ADA) there is no comparison, the 833A wins. For that tube stack cranked to eleven sound, the 833A rules. I might even build one! The harmonic spectrum is visible on the computer screen. The glowing 833A is visible above the left speaker. The speaker cabinet is visible on the right. I got the speakers on sale for $69 each at the grand opening sale at Mars Music. This was a few years ago, since Mars has since gone out of business. They are Electro Voice EV-10's. These can handle the Crown at full tilt without blowing up. They sound good too, especially for lead guitar. I built a cabinet just large enough to hold them both. It is very heavy, about 60 pounds. I have never heard this much sound come from such a small box before. I used to use 2 large 4 X 12" cabinets that I built in the early 1970's. They were large, heavy, and ugly (Sherri emphasized the ugly part) so I sold them a few years ago. This amp would be absolutely deadly through those cabinets. I built an amp at the same time that I built the speaker cabinet. It was a hybrid amp with a tube amp that put out 5 watts, driving a solid state "booster" that put out 300 Watts. Good idea, but it never sounded quite right, so I robbed it for parts. Next I built an all tube amp that used 6LW6 sweep tubes in push pull. That amp put out 140 Watts at full tilt with 700 volts on the plates. It sounded so good that I sold it. The speaker cabinet has been hanging around ever since. 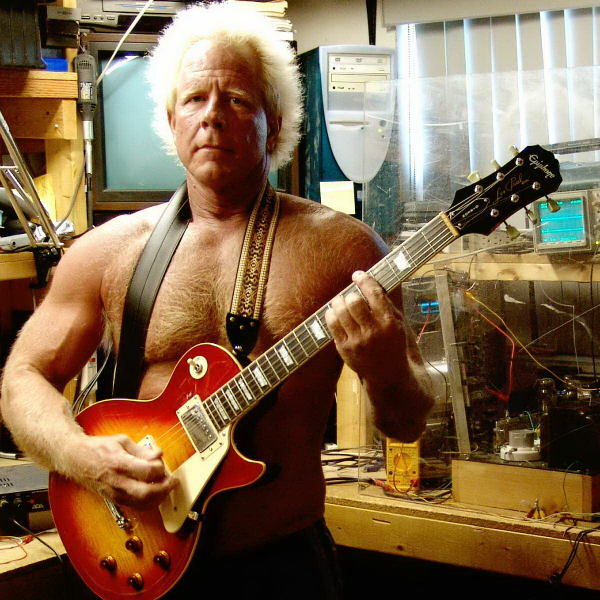 I typically play my guitar through an old Guild Ultraflex tube amp that I bought at a flea market for $35. I don't have any more time to devote to this project right now. I promised to evaluate the prototype transformer quickly when it arrived. Due to family emergencies, a hurricane, and 50 hour work weeks, the quick evaluation took three weeks. I must now disassemble the prototype and return the 845SE to working order. I need my bench back. The prototype transformer will now be tortured (oh I mean tested) by one of my associates in his 833A amp. The experiments have convinced me to build a complete two channel stereo amp, at a later date. 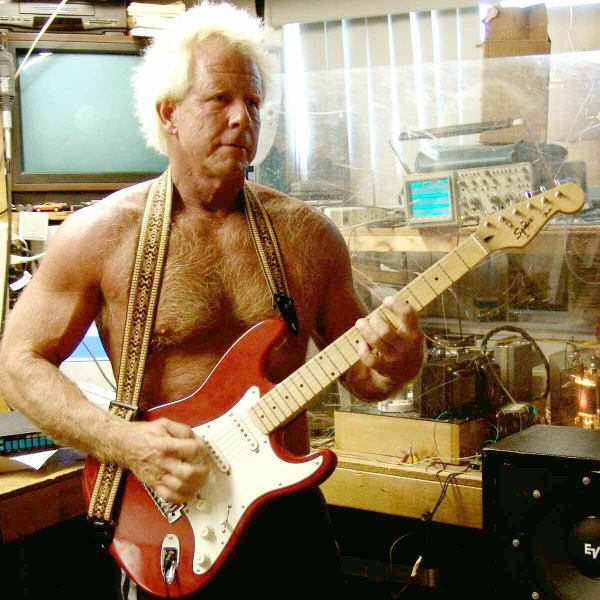 I might build a BadAss single ended guitar amplifier just because it sounded so cool. I seriously doubt the practicality of a 200 pound 200 watt single ended guitar amp, but I have never been practical any way.